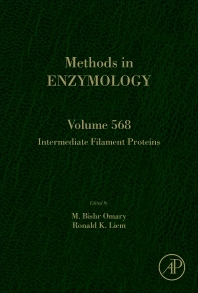 Intermediate Filament Proteins, the latest volume in the Methods in Enzymology series covers all the intermediate filaments in vertebrates and invertebrates, providing a unique understanding of the multiple different tissue-specific intermediate filaments. This volume also covers the latest methods that are currently being used to study intermediate filament protein function and dynamics. It will be an important companion for any experimentalist interesting in studying this protein family in their cell or organism model system. The audience is the cell biology, physiology and biochemistry communities, with a particular emphasis on those scientists who are interested in the cytoskeleton. Bishr Omary is professor and chair of physiology and professor of internal medicine at the University of Michigan Medical School, and an investigator at the Veterans Affairs Ann Arbor Healthcare System. Prior to joining the University of Michigan in 2008, he was at Stanford University for 19 years where he served as Chief of the Division of Gastroenterology and Hepatology, director of its NIH-supported digestive disease center, director of its NIH-supported training grant, and an investigator at the Veterans Affairs Palo Alto Healthcare System. He received his undergraduate degree from George Mason University, his PhD in Chemistry from the University of California (UC) San Diego and his MD from the University of Miami. He completed internal medicine residency training at UC Irvine then gastroenterology fellowship at UC San Diego prior to starting his first faculty position at Stanford University. He has published more than 160 original papers and 30 reviews and commentaries. Most of his publications involved studies pertaining to the function, regulation and disease association of keratin intermediate filament proteins in digestive organs. For example, his laboratory developed genetic disease models and showed that human mutations in keratin polypeptides 8, 18 and 19 (K8/K18/K19) predispose their carriers to acute and chronic liver disease progression. His group identified and characterized several keratin associated proteins, and multiple posttranslational modifications of keratins including phosphorylation, glycosylation, sumoylation, transamidation and acetylation. His group also helped define the importance of keratins and their posttranslational modifications in formation of the hepatocyte inclusions termed Mallory-Denk bodies. More recently, his work extended to drug discovery to identify compounds that could be used as potential therapy for intermediate filament associated diseases. He chaired the Gordon Conference on Intermediate Filaments in 2006 and has served as editor or co-editor of several review series on intermediate filament proteins. He has trained more than 20 postdoctoral fellows, many of whom have secured academic positions. Dr. Ronald Liem is a Professor of Pathology and Cell Biology at Columbia University Medical Center. He received his B.A. from Amherst College and his Ph.D. in Biophysical Chemistry at Cornell University. Following post-doctoral work at the University of Pennsylvania and Harvard Medical School, he joined the faculty at New York University School of Medicine. In 1987, he moved to his current position at Columbia University. Dr. Liem first started studying intermediate filaments of the nervous system as a post-doctoral fellow at Harvard. He has published extensively on the neuronal and glial intermediate filaments and identified -internexin as another neuronal intermediate filament, in addition to the neurofilament triplet protein. His laboratory also showed that -internexin was expressed earlier in development than the neurofilament proteins. His interest in neurodegenerative diseases led to a focus on mutations in neurofilaments linked to Charcot-Marie-Tooth disease (CMT), the most commonly inherited neurological disorder. He has developed cell and mouse models for the disease. He has also studied the family of cytoskeletal linker proteins called plakins. Knock-out studies of one of these plakins in mice, called bullous pemphigoid antigen 1 (BPAG1) results in sensory neuron degeneration and disorganized neuronal intermediate filaments. Further studies on the domains and functions of the neuronal isoform of BPAG1, as well as a related plakin MACF1 (Microtubule actin crosslinking factor 1) showed that these two proteins are versatile cytoskeletal linker proteins with isoforms that can interact with various cytoskeletal elements, including intermediate filaments, microtubules and microfilaments. In 1985, Dr. Liem co-organized one of the first international meetings on Intermediate Filaments for the New York Academy of Sciences. Subsequently, in 1990, Dr. Liem was the co-organizer and co-chair of the first Gordon Conference on Intermediate Filaments. He served as Chair in 1992 and this conference is still on-going today. Dr. Liem has been the recipient of a Jacob Javits Award from the NINDS and has published over 150 papers.